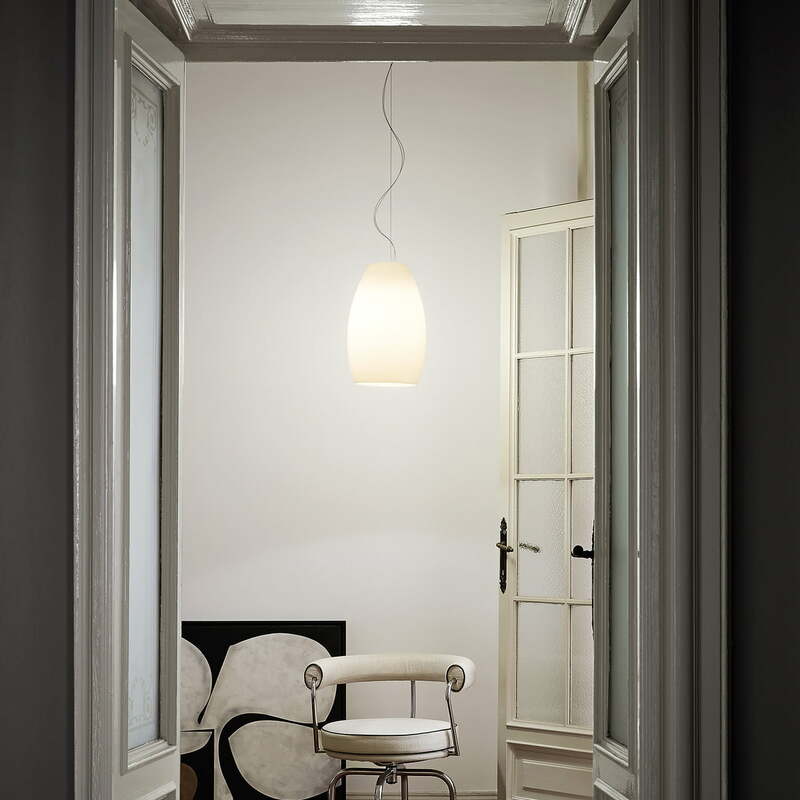 The Buds 1 pendant lamp is part of the Budsud collection by Foscarini. The design comes from the Italian designer Rodolfo Dordoni and distinguishes itself especially through its soft shape language. Through the slim silhouette, the hand-blown, glossy glass gets a classic, elegant appearance. The colour - white interior and coloured exterior - the pendant lamp gives extra charm and fits perfectly into any furnishing style. In addition the slightly transparent cable with broad sweeps meanders stylishly around the suspension rope of filigree steel, which gives the lamp a subtle movement. While the light shines more soft and semi diffuse through the oblong glass ball, through the round opening in the lower part of the luminaire a bundled light beam allows to illuminate the directly below surface . The Buds suspension lamp does not only find its place in private living rooms such as bedroom and dining room – thanks to its look and the elegant style it is suitable also as lighting for hotel lobbies or restaurants to set some shiny accents. Moreover, the combined arrangement with the suspended lights Buds 2andBuds 3creates a harmonious ensemble that draws attention in any room. As part of the Buds collection the luminaires are available in different variations, colours or as table lamp in several sizes. 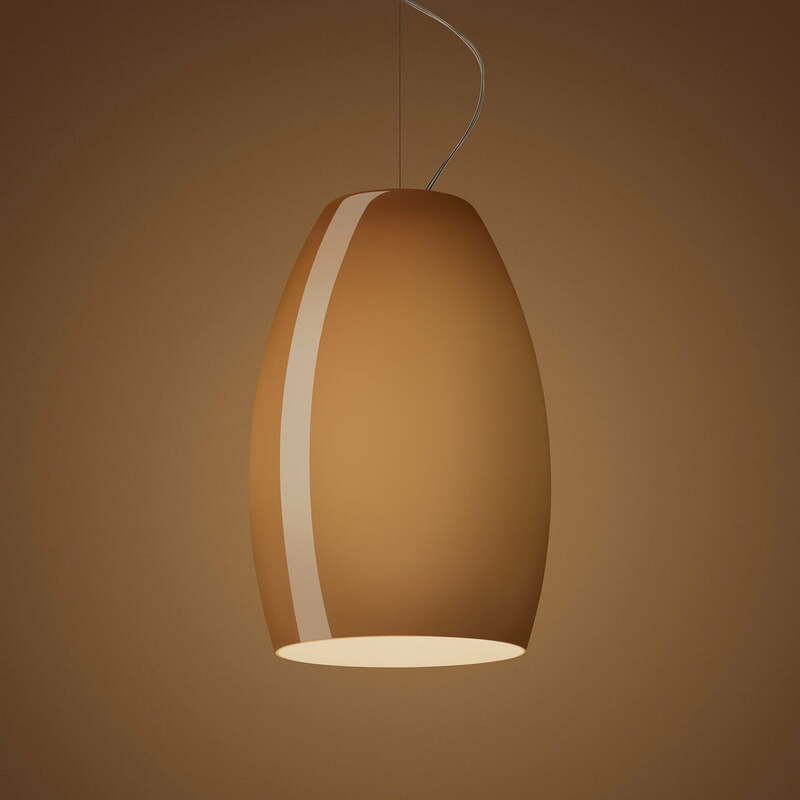 Individual image of the Buds 1 suspension light with lampshade in the colour white. With slender silhouette and a shiny surface, the light gets a noble appearance. Atmosphere image of the Buds 1 pendant lamp. While gentle light penetrates through the diffuser, an intense beam of light shines directly through the hole at the bottom. Atmosphere image of the Buds 1 pendant lamp. Whether in the hallway, living room or kitchen: the pendant lamp places gentle accents in any room and makes for a diffuse, and at the same time direct light output.